Fine for what it is, but hardly the best the GBA has to offer. The gameplay is tight and very much like the surfing minigame from California Games from the Lynx, just with a larger move set and more objectives. But there's not much variety. It's fun to pull out and play every once and awhile, but it won't last long. It's a decent game, but after some time, it felt like nothing in the game was really changing. It's really not the strongest extreme sports game for the handheld, but it's not really all that bad. Fans of surfing games may get the most out of this one, everyone else may only find small burts of enjoyment every now and then. How many of you remember California Games for the Atari Lynx? I know it was a long time ago that came out, but everyone who had a Lynx had that game since it was packed in. You had a choice of 4 games to play from, and the best in the pack was the surfing mode. From that point on, no one ever tried to capture the feeling of that one game until now. 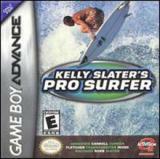 KSPS for the GBA is pretty much like the surfing round from California Games, but with more tricks, real riders and better graphics. But don't expect much beyond that. The GBA is a bit limited in how this type of game can be displayed. On the consoles, KSPS provided a variety of environments and wave conditions. Here, you pretty much see the same stage with a different pallate, background and wave heights. Sometimes you will start in a different direction. But really, there's not much depth to the environments in the game. But it's okay, since it's design is really ideal for compact play. Like California Games, your perspective is facing the side, as the wave comes towards from one end of the screen to another. Instead of being limited to spin tricks like CG, here, you can pull off spins, plus a few acrobatic tricks, as well as some face and lip tricks. And here's something you couldn't do in California Games, get points for being inside the tube. I remember trying to see how long I could stay inside the tube in CG, but get nothing for it. Well, now you can. Gameplay features include a championship mode and a challenge mode, where you need to clear 3 goals in one run. Not a bad set, but perhaps could use more. There are single session runs and multiplayer modes as well. Visually, there's not a whole lot going on in KSPS, but the water does look pretty nice, and pretty sparkly in the background. The rider animations are done well, but the character size may be a bit small. There are no framerate problems and other than that, there are no other problems with the game. The sound is decent, but not exceptional. The music is laid back, much like the console version. For some reason, the GBA version has an announcer that shout some things out every now and then. Why was that necessary? Although the stage design is limited in KSPS, the gameplay design is well suited in this format. It's not overly complicated and it's pretty fun. It also captures the feeling of the surfing mode in California Games on the Lynx very well, and fans of that game would be advised to take this game in consideration. It's a tight and simple, but effective extreme sports game for the GBA.